New Delhi: Shiva Gopal Mishra, Secretary, National Council (Staff Side) has submitted fifteen important items for inclusion in the agenda for the National Anomaly Committee meeting based on 7th CPC Anomaly on August 16, 2017 to Dy. Secretary - JCA, Department of Personnel & Training. The construction of Pay Matrix has opened up very many anomalies. From the illustration given here under, it could be seen that a person in higher Pay level but drawing same basic pay of person in the lower pay level gets lesser pay. It could also be seen that certain Stage in PB-2 GP 5400 has more benefit than a similarly placed employee in P83 GP 5400. (see the table). The Pay Matrix therefore has to be changed to remove the anomaly. 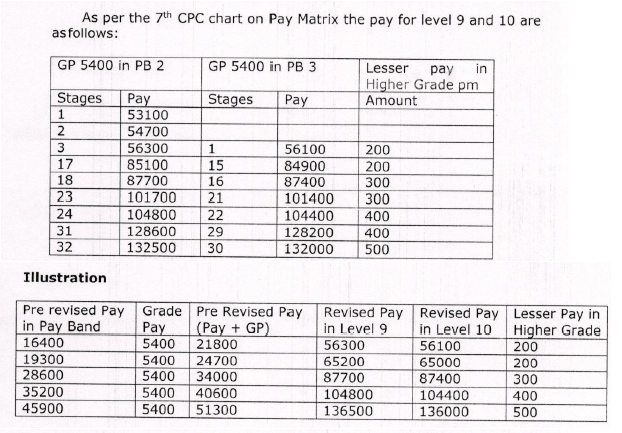 Basic Pay from the stage 3 of Level 9 of the Pay Matrix recommended by 7th CPC shall be higher than of stage 1 of level 10 for a same amount of pre revised basic pay (Pay in Pay Band + Grade Pay) for the grade pay of Rs 5400 in PB 2 and Rs 5400 in P8 3.